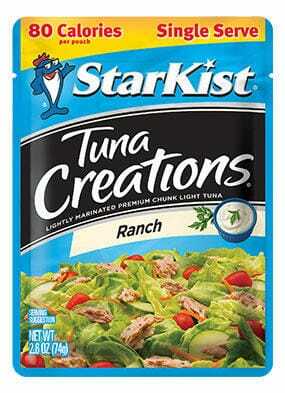 Ok, StarKist Tuna Creations may have been around for a while now, but in the instance that any of you may be unaware, I feel that it’s necessary to let you all know about them. Perfect for packing a quick lunch on a busy weekday, these portion controlled, individual packets of flavored tuna are nothing short of fantastic. They come in 5 different flavors (Lemon Pepper, Hickory Smoked, Ranch, Herb & Garlic, Sweet & Spicy), but my personal favorite is the Ranch…sooooooo good! Toss it with some fresh greens for an easy and delicious tuna salad, spread it on some whole wheat toast or crackers, or just eat it straight out of the pouch. StarKist Tuna Creations have been a life saver for me on the days I have a hectic schedule and don’t always have the time to prepare a healthy lunch. I actually discovered these a few weeks ago. I’ve been eating them on a rice cake which is 1 point so it’s a nice snack or a lite lunch. Really good!! !